The Canal Society was grateful to receive an award in today’s ceremony. 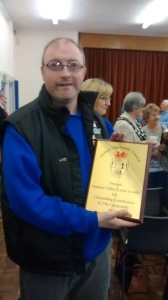 Paul was amongst the members who attended, and proudly accepted the plaque. Previous postTHE WEEK AHEAD: SUNDAY 12th APRIL TO SAT 18th APRIL Next postTHE WEEK AHEAD: 19TH APRIL TO 25TH APRIL.